We traveled to Hong Kong! She learned how to pull herself up on stuff! 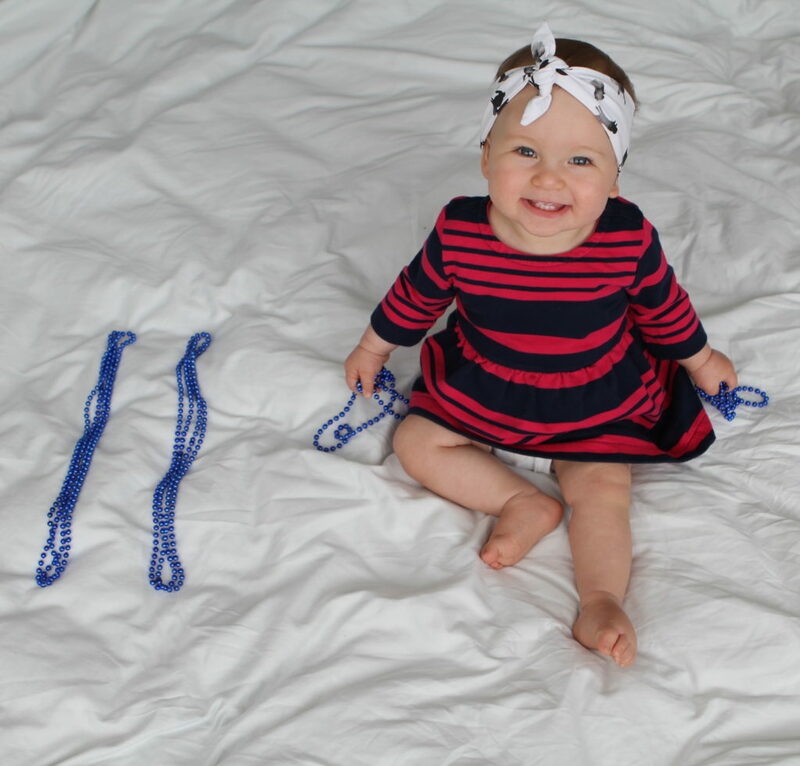 I only have to play keep-the-baby-away-from-the-beads-while-I-try-to-take-her-photo one last time after this! So many wins. 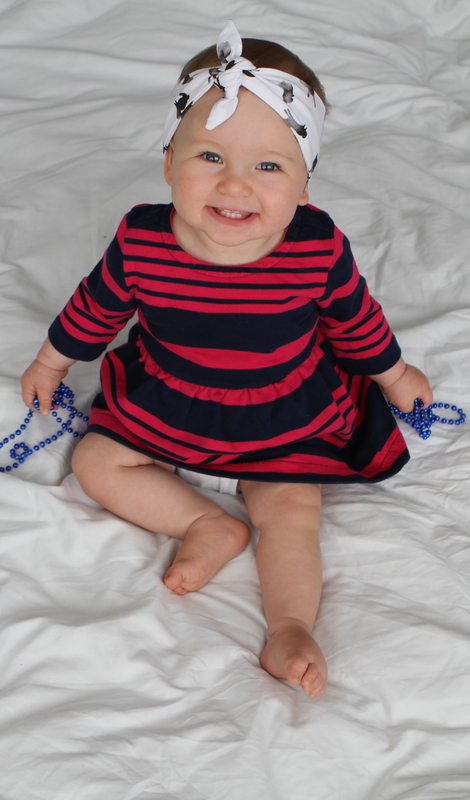 This is Ali at 11 months. Ali has made a variation of this little hum/whine as she falls asleep since pretty much the beginning. I finally caught it on video. You’re welcome. A lot of people thought we were pretty crazy for bringing a baby to Hong Kong, and we had our doubts. But as it turned out, Hong Kong with a baby was downright easy. Ali loved being toted around in the carrier everywhere, and despite the jet lag, the lack of proper naps, and some late nights, she was in impressively awesome spirits. Everywhere we went, people were happy to see Ali. They played peekaboo with her, waved and clapped with her, and she smiled back and made fast friends. We visited beautiful parks, boated around the bay, roamed the city, hiked the peak, and ate lots of dim sum, duck, congee, and noodles. I felt like I was able to relax for the first time in months, and Ali must’ve sensed it. Zen parents; zen baby. 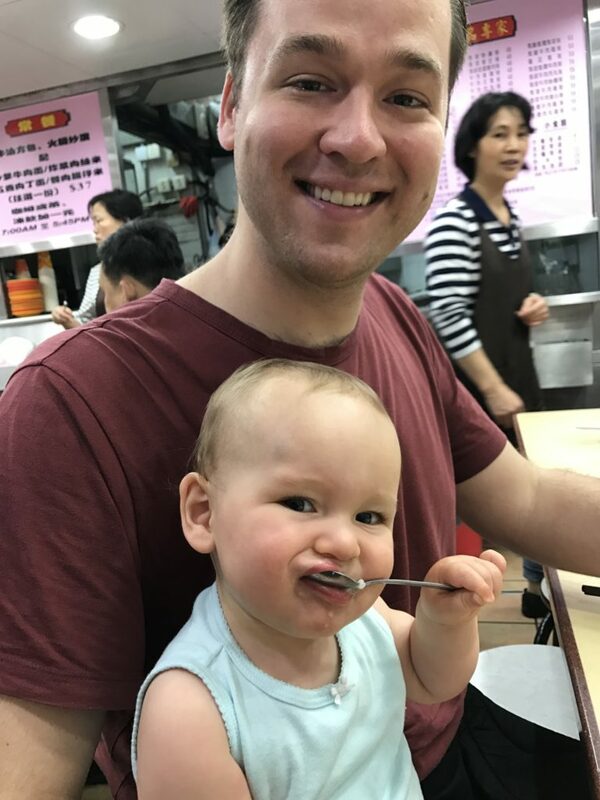 For a full round up of our trip, see my Traveling with a Baby: Hong Kong post. Also here’s Ali learning tai chi at the Hong Kong Botanical Gardens. She’s not very good yet. One of our big goals as parents is to raise an adaptable, resilient, adventurous human. Hong Kong was full of easy lessons. As someone who didn’t venture outside of my comfort zone much as a kid (those who know me will instantly recall my days of painfully picky eating), I want something different for Ali. I want her to try new things often. To be comfortable with being uncomfortable. To learn when to be patient. To understand that present discomfort often leads to great travel stories. To discover that even when a place feels vastly different from home, there are always commonalities that connect humanity. Hong Kong was an easy entry point into light adventure travel. There was a pretty painful 14 hour flight. There was 15 hour time difference jet lag. There was a new language and new sights and smells. But since we eat a lot of Cantonese food in San Francisco, the food was familiar. We knew lots of people there. And Hong Kong is a former British colony for the love of puppies, so despite the people all looking Chinese, most of them speak English and most western rules–like lining up for things, stopping at stop lights, the usual rules that do not necessarily apply in mainland China–apply. My advice to anyone who is considering traveling with a baby but is worried about the logistics is this: do it. And don’t sweat the details. We like to give Ali a letter grade after each flight. On the way to Hong Kong, the long, 14 hour way, she got a solid A. “Your baby doesn’t cry!” exclaimed a thrilled flight attendant upon landing in Hong Kong. Minus an incident during our final descent involving our failure to change a very wet diaper before said wet diaper leaked onto my lap, the flight was a wonderful success. On the way back, our normally very, very happy baby discovered the power of a well timed shriek. Her grade? C-. When we got on the plane, Ali quickly spotted the cup holder attached to the tray table. She opened it and closed it. Click clack. Click clack. A man sat down in the seat in front of us. I tried to distract her from the cupholder to spare the poor man. Ali wouldn’t be dissuaded. I pulled her away. She screamed. I applied trolley problem logic and decided that one man’s suffering from a baby pulling on his seat was better than a full plane suffering from the piercing screams of an almost toddler. She resumed her click clacking. I was that mom. An hour into the flight, Ali was exhausted but would. not. sleep. It was hot and bright on the plane. Every time she almost fell asleep, one of the twenty babies on the flight would wail and she’d startle awake. Then she’d start wailing herself. To quiet her, I nursed her more times than I did when she was a clusterfeeding newborn. Eventually she passed out, but not for long. When she woke up, she rediscovered the cupholder. She crawled back and forth between Michael and me for what I’m sure added up to miles. She ate some food, but was quickly full. I cursed my stupid hippie self for packing calorie dense almond muffins and oatmeal bars and forgoing Cheerios or those little puffs moms always rave about. Sometimes eating is about passing the time. With six hours left, she passed out for the remainder. I finished my book. I dozed off. And when I woke up, we were in San Francisco. We survived. And next time, I’m bringing some damn (organic) puffs. As adventurous as I fancy myself, I get anxious when it comes to doing things decidedly outside my comfort zone. So when we ventured out one morning to get congee, a typical local breakfast consisting of rice porridge and meat, and we discovered the little hole in the wall, 1. had communal tables, 2. had no English menu or English speakers whatsoever, and 3. had a decidedly “men on their way to work at their finance jobs” vibe, I balked. I didn’t want to be that family who brought their baby into a too small space, who ordered the wrong thing, who stepped on peoples’ toes. But then I remembered, this is what travel is about! Getting uncomfortable! Doing it anyway! Being nice and trying your best to communicate with pointing and gesturing! We went for it. Michael ordered congee with pig giblets, because he was feeling hyped on all the discomfort. I had congee with beef. I loved it. Ali loved it. Everyone in the restaurant loved Ali. And all ended well. Loves: Vilma, her nanny, and Fintan, her nanny share buddy. She was so happy to see them both after our trip! Favorite Eats: Fruit. She swallows strawberries, raspberries, and tangerines whole she loves them so much. New Skills: Pulling herself up to stand on everything, clapping with her feet, high fives (sometimes? maybe I’m exaggerating her ability to do this one? ), crawling up stairs. My Favorite Thing About This Age: I love the way she smiles at strangers. Sometimes she’ll get a bit shy and bury her face into my chest, but by the time she peeks back out and flashes a big grin, she’s usually made a new friend.